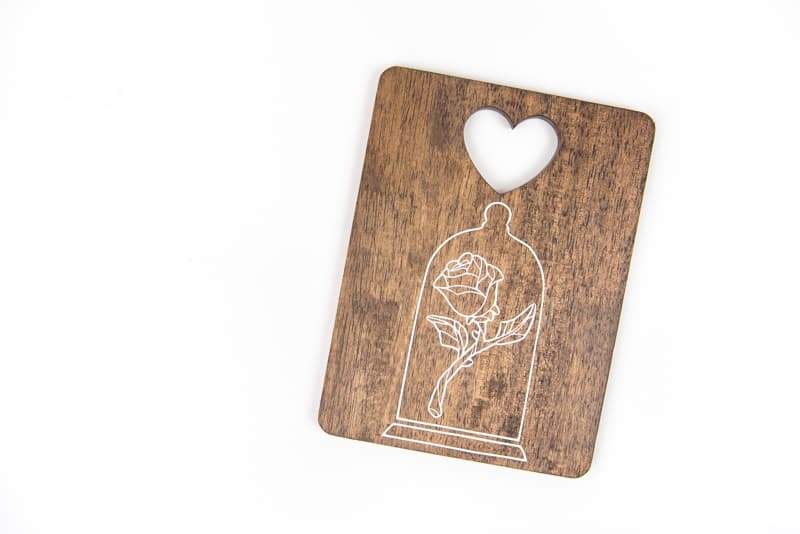 Upcycle this Target Dollar Spot board with your Silhouette Machine to make a magical Beauty and the Beast Enchanted Rose piece of art! I was six when Beauty and the Beast came out in theaters. That day started my obsession with all things Disney, and my twenty-some year love affair with Belle and her story. The bookish girl who wanted adventure was my spirit animal and I wished nothing more as a six year old girl to be her. My room, in my parents house, was decorated from floor to ceiling in pink Beauty and the Beast wallpaper and bedsheets. Through the years I collected a ton of memorabilia, my favorite being a porcelain Belle doll that my parents gave me and a giant puzzle that my dad and I glued together and put in a frame. The one thing that was always missing though was an enchanted rose of my very own. Which was the inspiration behind this Beauty and the Beast Enchanted Rose Art! The one thing I loved about Belle was how she never cared what other people thought of her. The entire town thought she was odd because of how much she loved books but that didn’t stop her from being true to herself and continuing to do what she loved. Belle is awesome. And brave. And selfless. Who wouldn’t want to be like her? I love that Disney did a live remake of the movie to get the younger generation excited about the movie. I also loved that Luke Evans and Dan Stevens were in it (hello hot stuff 😍), and my favorite bookworm….Hermione Granger er, I mean, Emma Watson. While the animated classic will always be my favorite, I wasn’t disappointed in the remake. Learn how to make your own Beauty and the Beast Enchanted Rose! + Stain your piece of wood and set it aside (I bought mine at the Target Dollar Spot before Valentine’s Day, 2017). + Cut out your Beauty and the Beast Enchanted Rose File (bought on Etsy) and weed it! I like to have the original image up on my computer so I can make sure I’m weeding the right tiny pieces. + Lay a piece of transfer tape over your enchanted rose file and rub it roughly with your finger. Slowly pull up the transfer paper and make sure your design is coming with it. If it doesn’t try laying the transfer paper back down, rub it again, and then try to pull it back up. Continue doing this until all of your design is on the transfer paper. + Line up your design on the wood and then lay it down. Rub the transfer paper on the wood and then slowly peel it up. Make sure your design is sticking to the wood when you do! Otherwise you need to lay the paper back down and continue rubbing the transfer paper with your finger until your entire design sticks to the wood. + Use your glue to trace the white vinyl rose and sprinkle glitter on top of it. Make sure you use as little glue as possible at this point, you don’t want to overdo it. Then you can sprinkle the glitter on the inside of the rose or on the outline, whatever you like better! If your love Disney movie inspired crafts, you need these in your life! 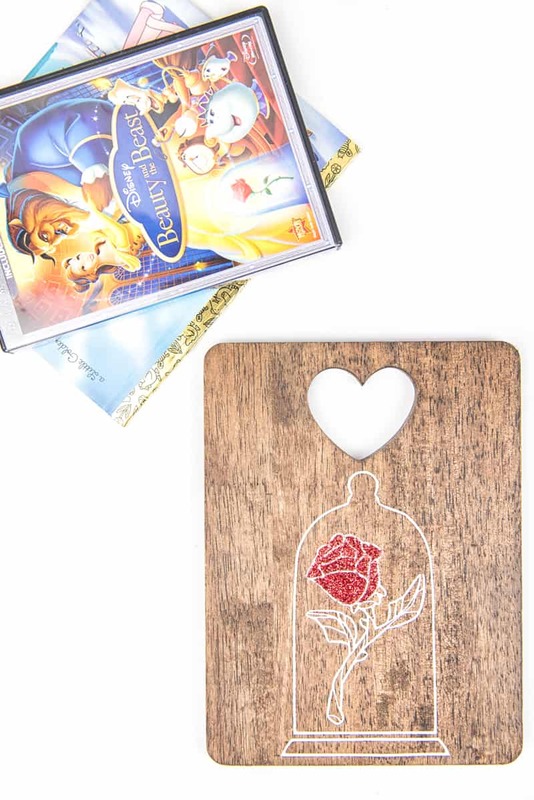 I think this Beauty and the Beast Enchanted Rose art is so sweet and would be so cute in a little girls’ room (or my future office! haha). It’s the perfect DIY for scrap wood and vinyl and it’s super easy to do too. You could even paint the leaves and stem to give it a more stain glass window look. There’s just too many options! If you’ve seen the remake what did you think? Were you a fan? Or do you wish they’d just leave the classics alone? what a great idea! Love it. My FAVORITE Disney movie ever! This is such a cute idea, I love how it turned out!! Beauty and the Beast was always one of my favorite Disney films. I can’t wait to see the live action version. Thanks for sharing this adorable craft!